Greg Mankiw has a blog post commenting on my previous post on the so-called Mankiw rule. I show in my post that according to both the original and a re-estimated version of the Mankiw rule the Federal Reserve should be hiking rates right now. I should stress again that I don’t think the Fed should hike interest rates – I am only using the Mankiw rule to illustrate why we likely are moving closer to a rate hike from the Fed (that is the is a difference between thinking about what the Fed will do rather than what it should do). Taken at face value, the rule suggests that it is time for the Fed to start raising the federal funds rate. If you believe this rule was reasonably good during the period of the Great Moderation, does this mean the Fed should start tightening now, as the economy gets back to normal? Maybe, but not necessarily. There are two problems with interpreting such rules today. The first and most obvious problem is that odd things have been happening in the labor market for the past several years. The unemployment rate (one of the right hand side variables in this rule) may not be a reliable indicator of slack. The second and more subtle problem is the nagging issue of the zero lower bound. For several years, the rule suggested a target federal funds rate deeply in the negative territory. We are out of that range now, but should the past “errors” influence our target today? An argument can be made that because the Fed kept the target rate “too high” for so long (that is, at zero rather than negative), it should commit itself now to keeping the target “too low” as compensation (that is, at zero for longer than the rule recommends). By systematically doing so, the Fed encourages long rates to fall by more whenever the economy hits the zero lower bound. Such a policy might lead to greater stability than strict adherence to the rule as soon as we leave negative territory. I agree with both points. It seems particularly problematic for the original Mankiw rule that there seems to be a major problem on the US labour market with a discouraged worker effect – as a result the actual unemployment data tend to underestimate just how bad the situation has been (and still is?) on the US labour market. Many have simply given up looking for a job and left the labour market. 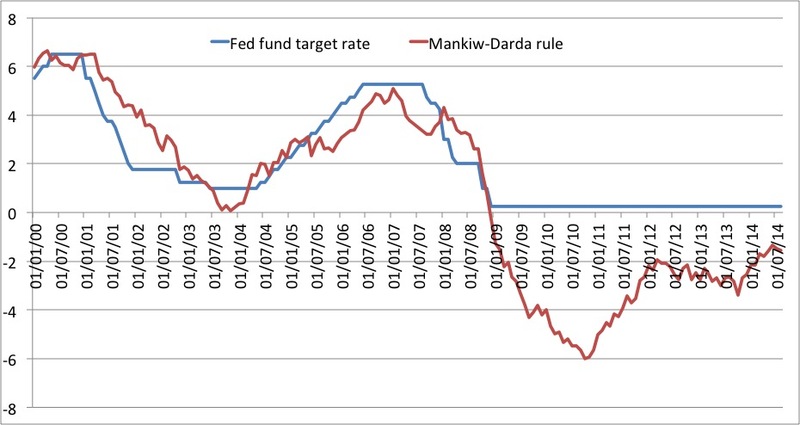 We see that while the Mankiw-Darda rule has become increasingly “hawkish” since early 2011 it is still not “recommending” a rate hike – the predicted Fed fund rate is still negative (around -1.5%). Hence, it seems like the Mankiw-Darda rule is better at actually describing what the Fed is doing than the original Mankiw rule. This is not totally surprising. Inflation targeting or price level targeting? There is another (related) argument for not raising rates now to offset shortfalls in the past. It is not about the interest rate. It is about the price level, the ultimate goal of monetary policy and measure of its performance. 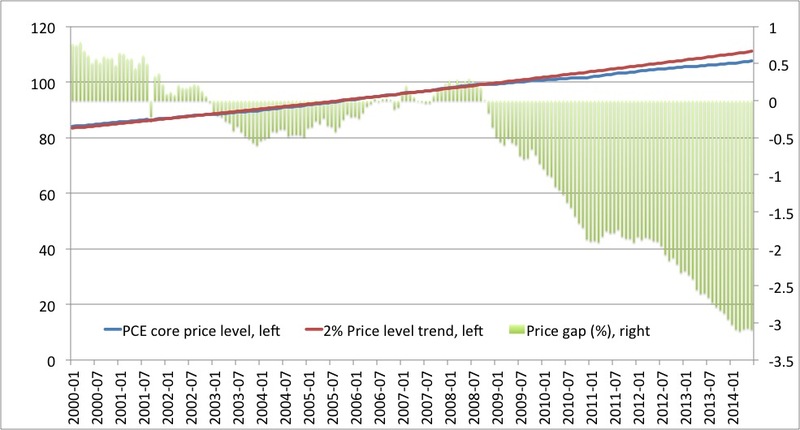 If you plot the PCE deflator, there is a clear shortfall relative to a 2% price-level target. A 2% price level target fits very well during Greenspan’s time. By the end of 2008, we were exactly on the 1992-target. But when I look at that plot starting in 2009 until the most recent data I see a gap. A price-level target rule is optimal in normal times (Ball, Mankiw, and Reis) but is also an optimal policy in response to the dangers of the zero lower bound (Woodford). We have to catch up for the shortfall in the price level right now. And if you look at inflation expectations from surveys or markets, there seems to be no catch up expected, indicating that policy is still too tight. Obviously I would prefer a nominal GDP level target to a price level target, but I think a price level target as here suggested by Greg is much preferable to an inflation target. The graph shows that it looks as if the Fed prior to 2008 had a 2% price level target and the actual price level closely followed a 2% trend line. However, since then inflation has consistently been below 2% and as a result the “price gap” has become increasingly negative. This is paradoxical as the Fed now officially has 2% inflation target, while it prior to 2008 did not have such a target. This is obviously another argument for why the original Mankiw rule at the moment is too “hawkish”. On the other hand one can certainly also discuss whether the Fed should close the “price gap” or not. Here I have the relatively pragmatic view that the Fed should let bygones-be-bygones as we over the past five years have seen some supply side adjustments. Furthermore, the decline in the price gap does not only reflect demand-side factors but likely also reflects a positive supply shock. In that regard it should be noted that longer-term inflation expectations in the US still remain above 2% (5-year/5-year US breakeven inflation this morning is 2.4%). Therefore, if I was on the FOMC I would not favour a one-off money injection to close the price gap, but on the other hand the Mankiw-Darda rule and the consideration about the price gap also shows that the FOMC should not be in a hurry to tighten monetary conditions either. The Fed’s gradual and fairly well-communicated policy to continue “tapering” and then sometime next year gradually start increasing the fed funds rate therefore is consistent with a policy of ensuring nominal stability and it is also reducing the risk of a 1937-style premature tightening of monetary conditions, which would send the US economy back in recession. Said in another way I find it hard to be very critical about how the Fed at the moment is balancing risks both to the upside and to the downside. The discussion about the Mankiw rule illustrates two problems in common monetary policy thinking. First there remains a major focus on the US labour market. The problem of course is that we really don’t know the level of structural unemployment and this is particularly the case right now after we in 2008 got out of whack. Second, while inflation clearly has remained below 2% since 2008 we don’t know whether this is due to supply side factors or demand side factors. There is of course a way around these problems – nominal GDP level targeting – and as I have argued in a recent post it in fact looks as if the Fed has followed a 4% NGDP level target rule since July 2009. That would not have been my preferred policy in 2009, 2010 or 2011 as I would have argued that the Fed should have done a lot more to bring the NGDP level back to the pre-crisis trend-level. However, as time has gone by and we have had numerous supply shocks and some supply adjustments have gone on for nearly six years I have come to the conclusion that it is time to let bygones be bygones. We can do little to change the mistakes of six years ago today. But what we – or rather what the Fed can do – is to announce a policy for the future, which significantly reduces the likelihood of repeating the mistakes of 2008-9. Therefore, the Fed should obviously announce a NGDP level target policy. Whether the Fed would target a 4% or a 5% path for the NGDP level is less important to me. It would be the right policy, but it would also be a pragmatic way around dealing with uncertainties regarding the state of the US labour markets and to avoid having supply side shock distorting monetary policy decisions. PS My friend Marcus Nunes also comments on the Mankiw rule. Marcus seems to think that I am advocating that the Fed should tighten monetary policy. I am not doing that. All I have been saying it that the original Mankiw rule indicates that the Fed should tighten monetary conditions and that this is an indication of the direction we are moving in. PPS My “playing around” with the Mankiw rule should be seen in the perspective that I am currently thinking quite a bit – in my day-job – about when the Fed will actually hike relative to what the markets are thinking the Fed will do. If the Fed moves earlier than expected by markets then it obviously is going to have clear implications for the global financial markets.